Microsoft assumes that you’re going to use their basic programs on your Windows 7 computer, and usually they’re right. But if you prefer to use another program for specific tasks, you need to tell Windows by setting your Program Defaults in Windows 7. For example, Microsoft has Internet Explorer 8, but you might prefer Firefox or Chrome. Or, perhaps you want to use iTunes to manage your music collection instead of Windows Media Player. With Windows 7, you have more opportunities than ever before to override the default Microsoft programs with your own choices. Make sure that the program you want to make default is fully installed. Otherwise, Windows can’t find them and doesn’t offer them. Choose Start→Default Programs. Then click the bottom link: Set Program Access and Computer Defaults. You see the Set Program Access and Computer Defaults dialog box. Click the Custom down arrow and choose your default program choices for Web browser (Firefox? 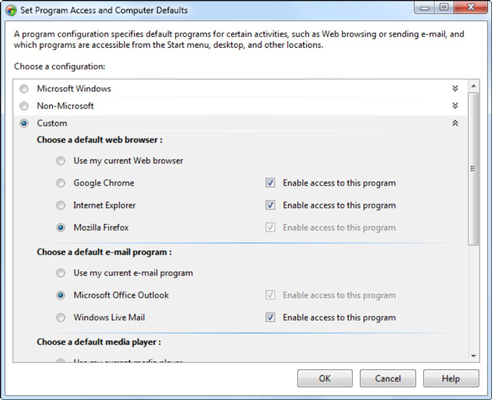 ), e-mail program (Outlook? ), media player (iTunes? ), instant messenger (Trillian? ), and anything else. Changing the default program moves it to the pinned area of the Start menu, replacing whatever was there. Selecting the default automatically sticks the preferred icon on the Start menu/taskbar, but it also determines which applications open when you click links or file types. Your changes take effect immediately. Run over to the Start menu and check it out.